Greetings, dear readers, and happy Monday! The weekend was far too short, and here we are at the start of another week already! Hopefully you enjoyed the weekend and this week is already off to a wonderful start for you! 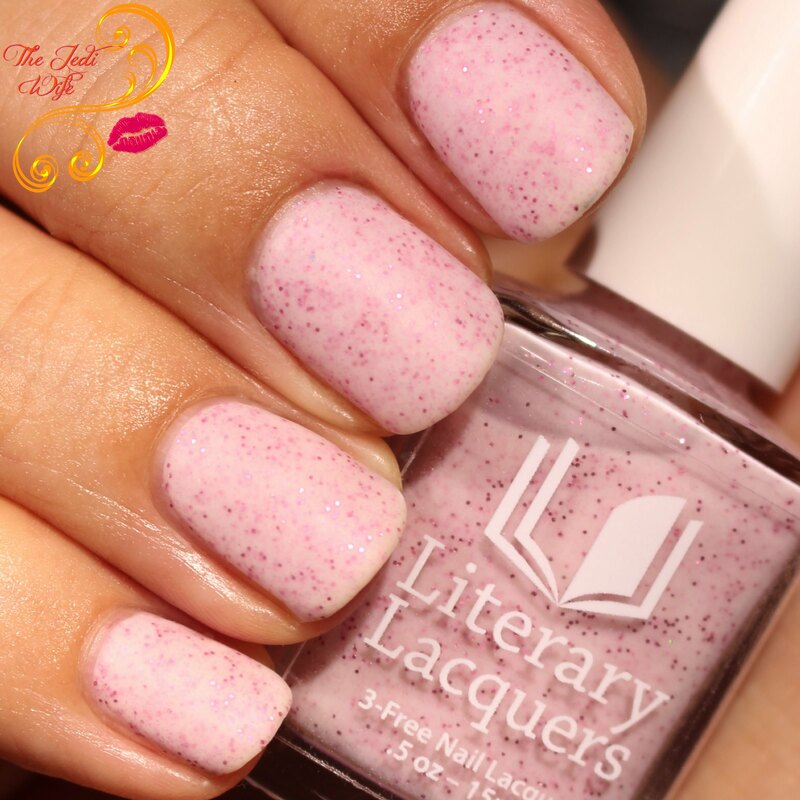 To start off my week, I thought I would share with you a new trio from Literary Lacquers, inspired by The Princess Bride. I have never actually read the book, but I have seen the film that was adapted from the fantasy romance novel. Amy, the creative mastermind behind the brand, has developed two new core shades and a third limited edition glitter topper to complete the trio. Let's get a closer look at each of these polishes! 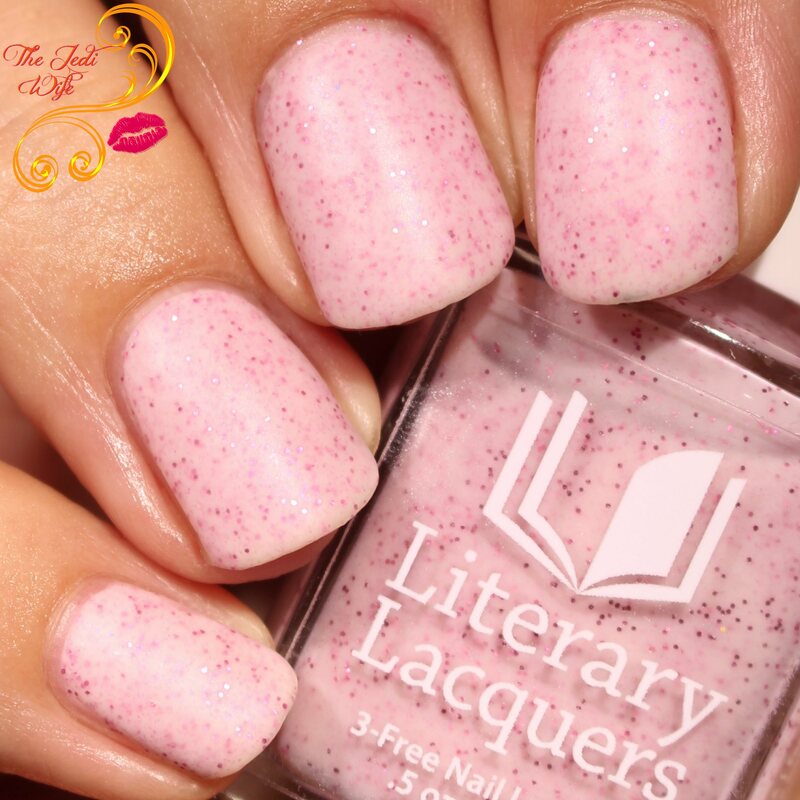 Princess Buttercup is a white matte polish that has been accented with pink glitter and shimmer. 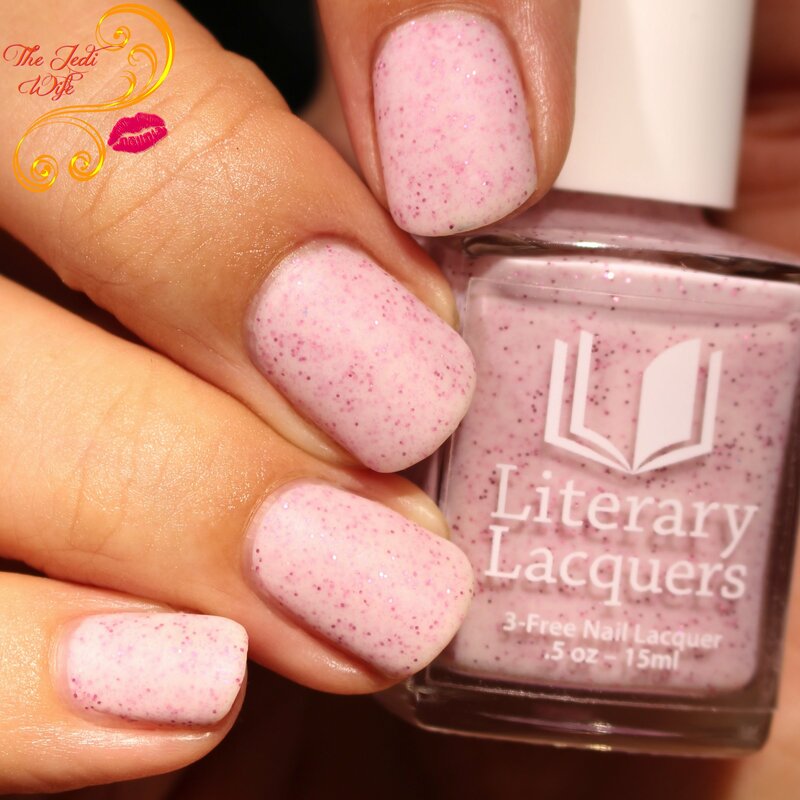 This polish is a little on the sheer side and requires three coats for opacity. That being said, the matte formula dries quickly so it took no time at all to build up this beauty on my nails. While white-based polishes are notorious for having tricky formulas, I had no issues whatsoever with this stunner. 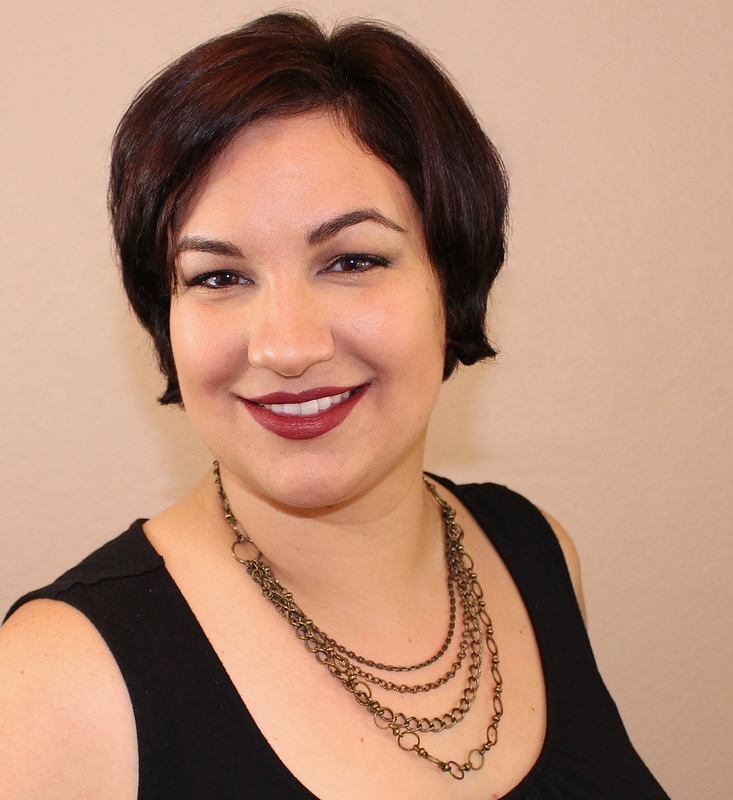 In spite of the glitters and shimmer, the final look is relatively smooth overall. I added a layer of matte top coat just to smooth out the slightest hint of bumpiness for these photos. 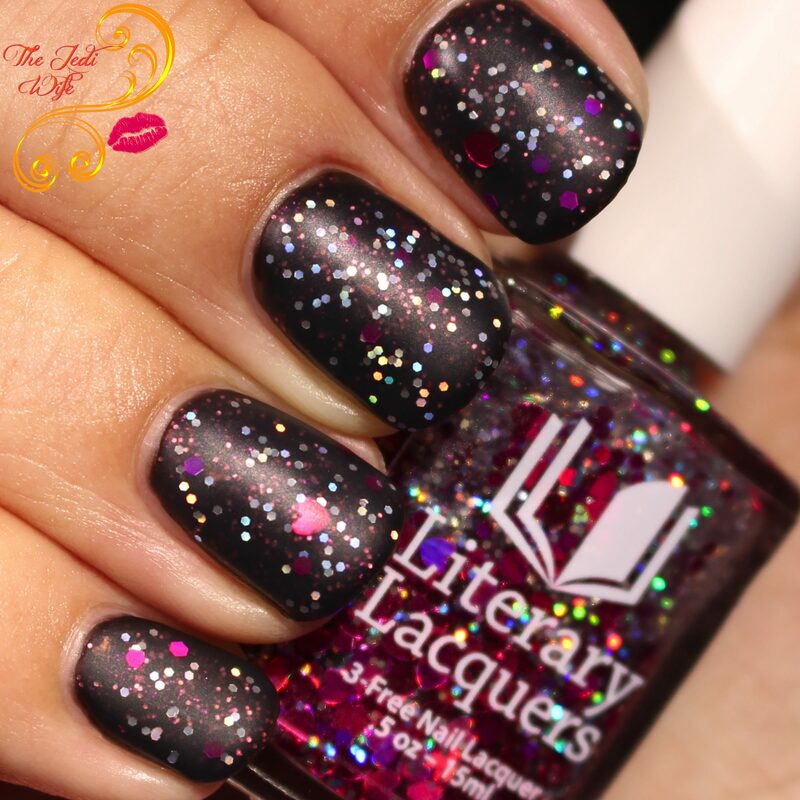 I have a weakness for black-based glitter polishes, so I am glad to see one in the new Literary Lacquers lineup! 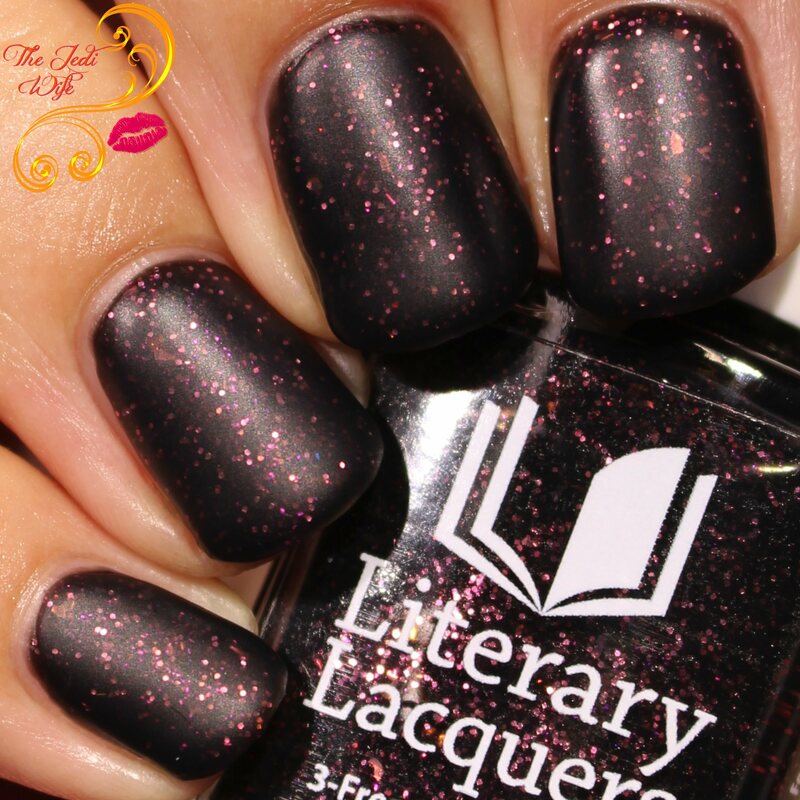 The Man in Black is much like its white counterpart: a polish filled with pink glitters and shimmers with a matte finish when dry. I LOVE IT! The formula is also a little on the sheer side and required three coats for me to cover all visible nail line. Again, because it is a matte polish, it dries quite quickly, so needing a third coat is far from an inconvenience. It also dries to the slightest bit of texture; I added a layer of matte top coat for a smoother look for these photos. 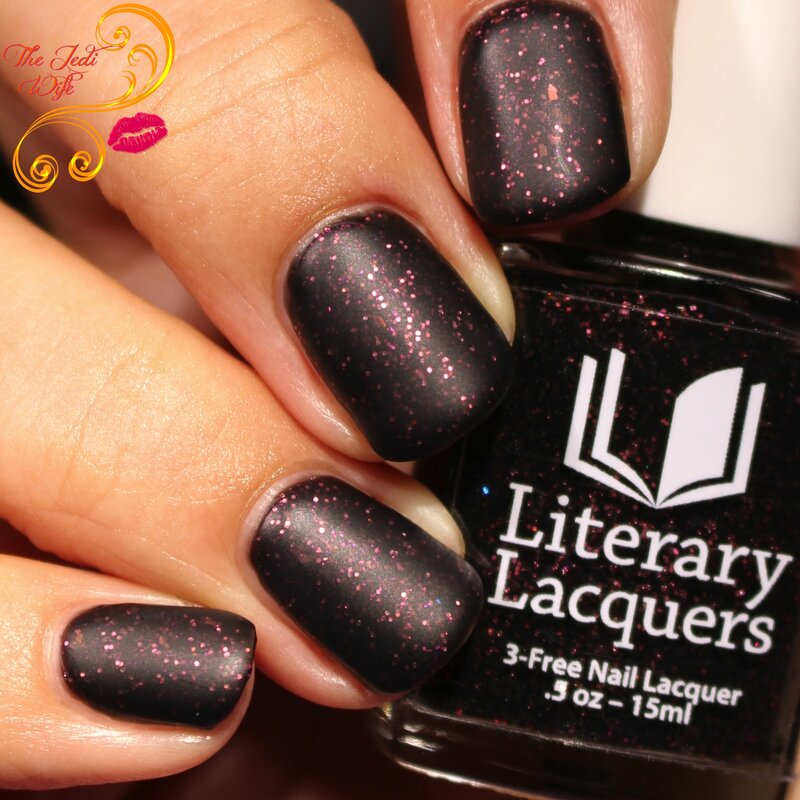 As I mentioned previously in this post, Literary Lacquers is also launching a third shade that is going to be limited edition. The limited edition shade is Mawage, a lovely glitter topper. 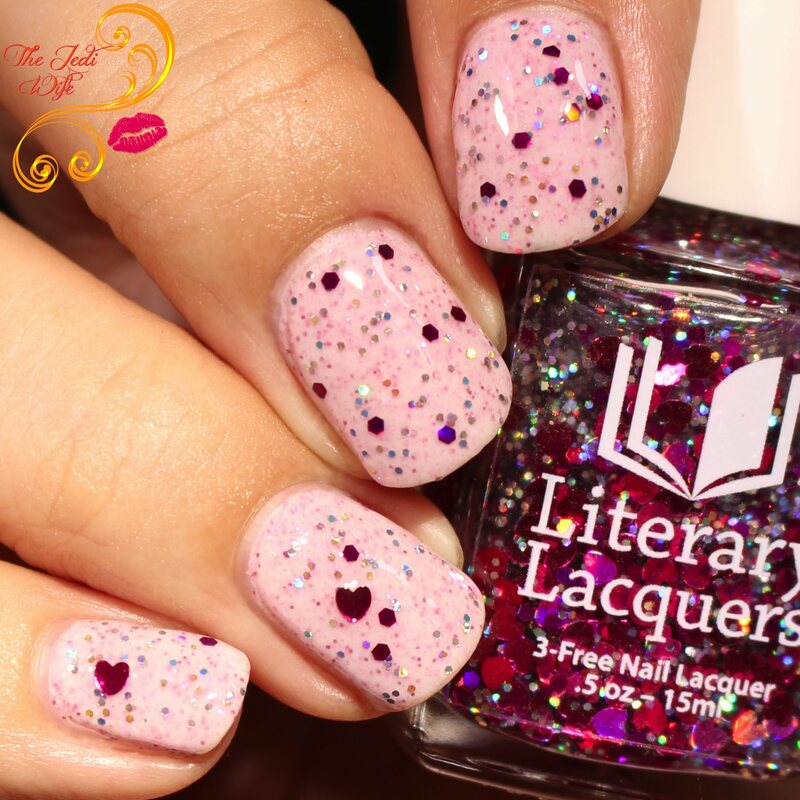 Mawage is a clear-based glitter topper composed of silver and dark pink hexagon-shaped glitters and larger dark pink heart-shaped glitters. The glitters are suspended throughout the base; however, because the heart glitters are larger, and therefore heavier, they do sink some to the bottom half of the polish bottle. Whenever you plan to wear this topper, I recommend propping it upside down for about twenty minutes or so while you start your manicure so the hearts are a little more evenly dispersed throughout the base. I used a coat of Mawage over Princess Buttercup for these photos. Mawage utilizes a more shiny/non-matte base, and I added a layer of shiny top coat over my nails here for a smoother finish. I applied a coat of Mawage over The Man in Black as my base for these photos above. I then added a coat of matte top coat. While it is pretty with a shiny finish as shown over Princess Buttercup in the previous set of photos, I am smitten over this matte look! One other feature of Mawage of note is the smell. It is rather strong with its chemical fragrance, but it disappears quickly when it dries. I don't find it to be a deal breaker by any means, but you may want to be sure to paint your nails in a well ventilated area. Ideally we all should do so anyway, but in case you don't, this is a time when you will want to. 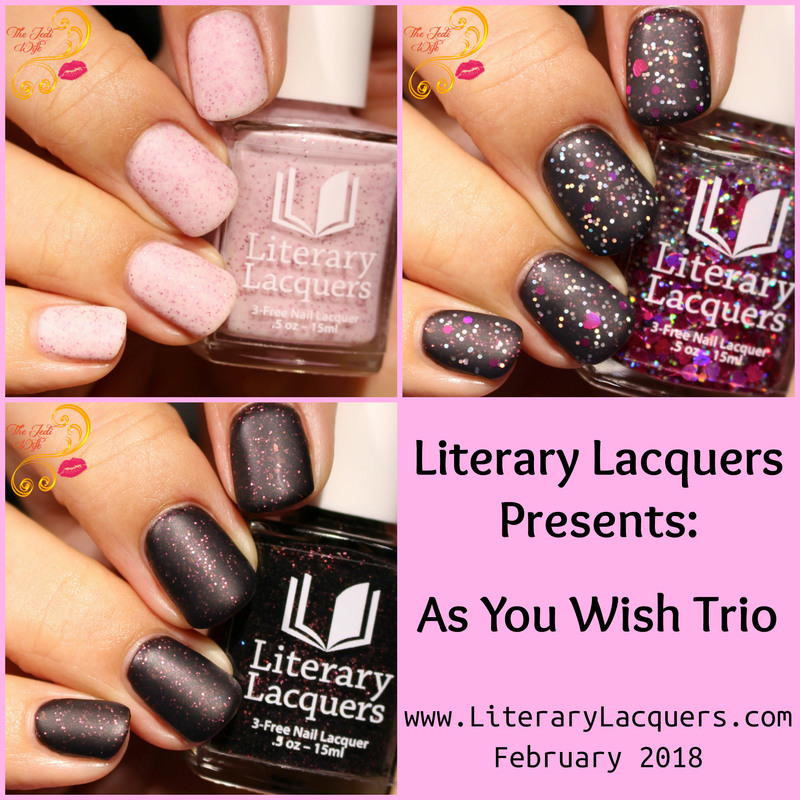 The As You Wish Trio will be launching at 12 noon MST on the Literary Lacquers website this Friday, February 2nd. Each polish will retail for $10, or you can pick up the trio while all three shades are available for $27. 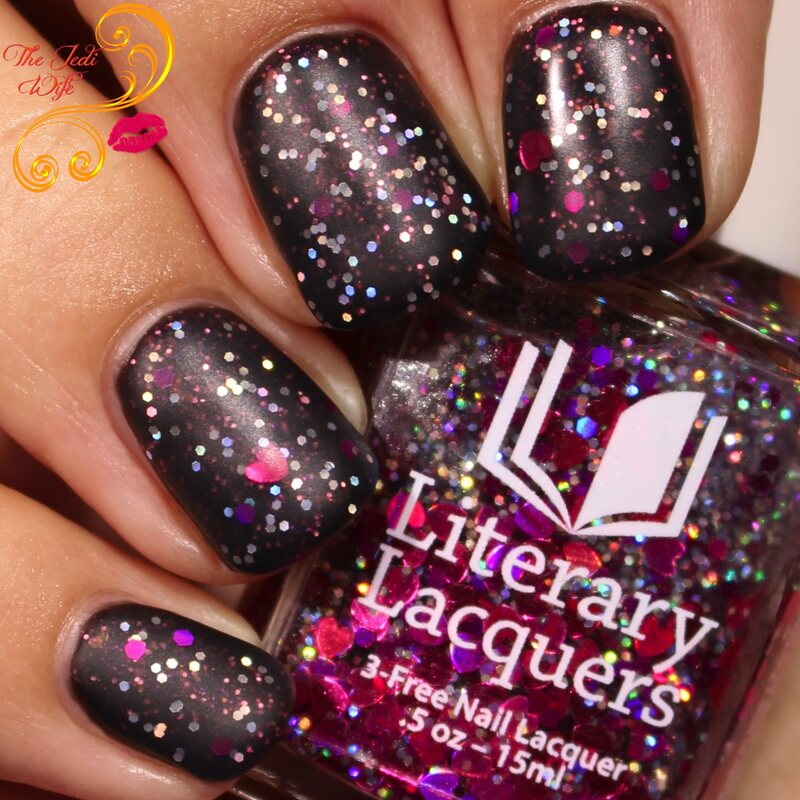 Mawage, the limited edition glitter topper, will only be available for purchase through the month of February only. Are you a fan of The Princess Bride? Do you have a favorite shade from this trio? 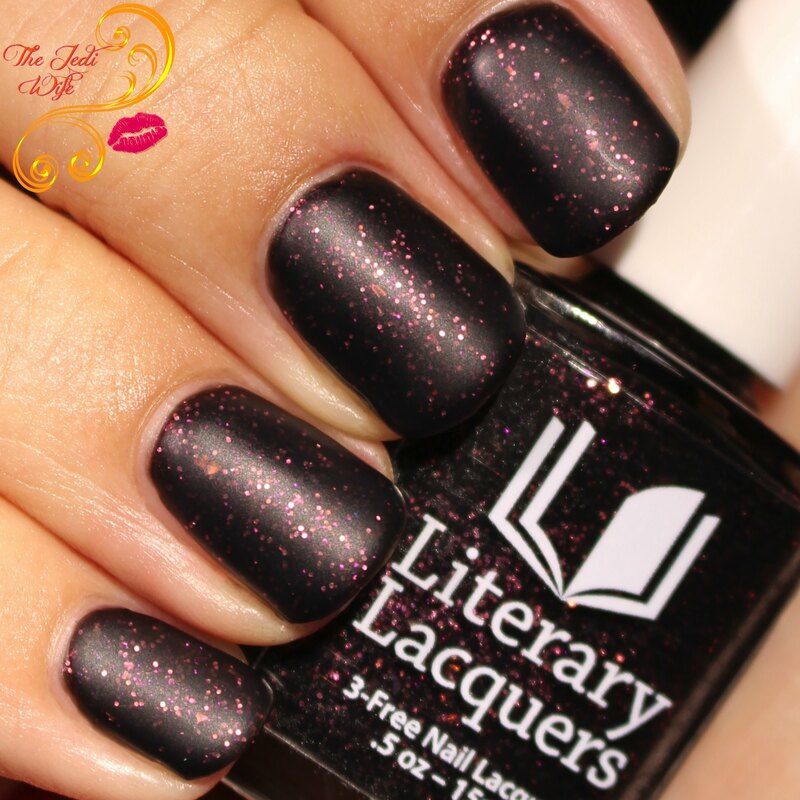 I'm excited to see more matte polishes join the Literary Lacquers lineup, and I hope you are too! I haven't seen the movie, but I've read the book. Mawage and The Man in Black are so pretty! The Man in Black is stunning. This is such a standout. I need to edit my swatches! I love Mawage over black and matted!!! Would have never thought of that combo but it is true perfection!!! You had me at princess bride references!! Those are perfect for Valentines Day! I really like the 2 core shades. I love the first one! It’s so soft and sweet! omg I'm such a sucker for the Princess Bride. These are perfect! Wow these are all so nice! I like how they have matte finishes. I'm really loving Man in Black! It's such an upgrade from a regular black polish. 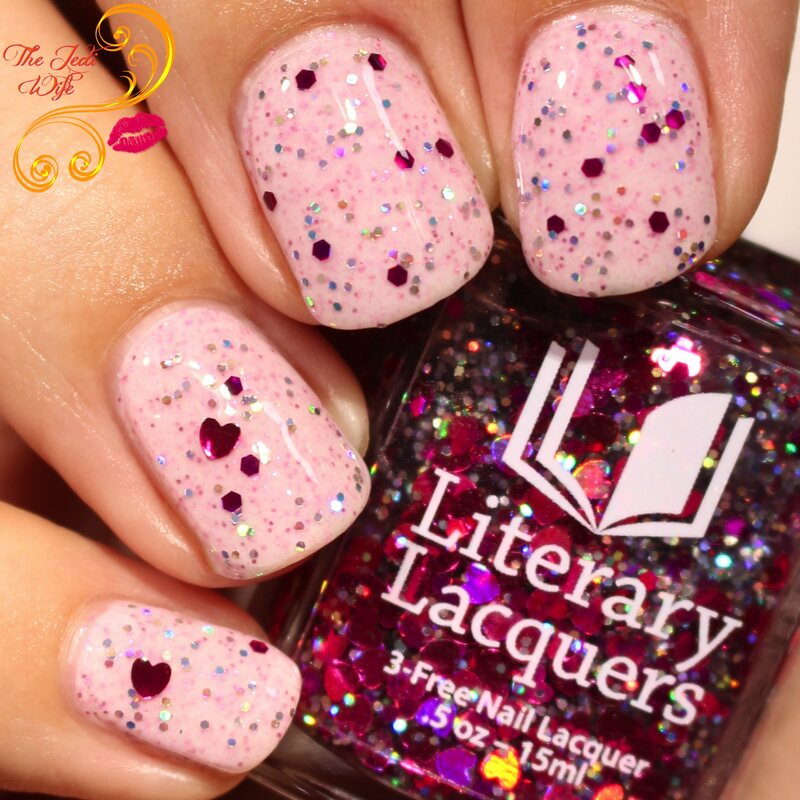 Mawage looks great for Valentine's Day, especially paired with Princess Buttercup. The Man in Black looks really pretty! Mawage is such a cute topper! It's been a while since I've seen on. I absolutely love Princess Buttercup! Love these for Valentine’s Day plus the inspiration behind them! I love these and especially Princess Buttercup -- they are gorgeous. I like all of these and they’re perfect for Valentines Day.